After four years of drought – and spotty summer rain – our plants are blooming at unusual times. As we’ve already featured many of our December-blooming plants, we’ve chosen a species that often begins growing in December for our Plant of the Month. 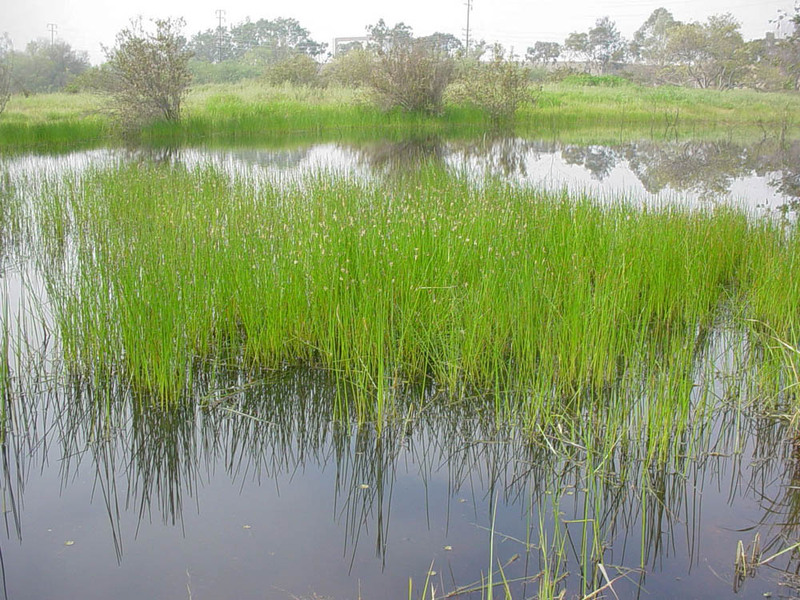 The Spikerushes (genus Eleocharis) are a common component of wetlands throughout the world. These grass-like plants, members of the Sedge family (Cyperaceae), have rudimentary leaves and understated flowers at the tips of upright stalks. 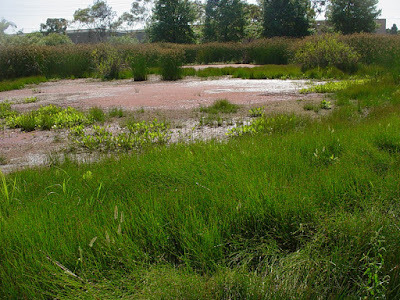 Nearly all are wetland species and some – like our own Pale spikerush – can even begin growing in shallow water. The taxonomy of the Spikerushes presents challenges not uncommon in plants with relatively few relevant characteristics and cosmopolitan (widespread) geographic distributions. Eleocharis macrostachya grows from Alaska and Northern Canada, as far East as the Great Plains states, and South to Mexico and South America (Argentina, Colombia and Uruguay). In California, it’s a common and widespread member of wetland communities from sea level to about 8,000 ft. (2500 m.) It grows in a variety of wet places including marshes, roadside ditches, and along streambanks, lakeshores and rivers. It also can be seen in seasonal wetlands, including mountain meadows, vernal pools/marshes and other seasonally flooded areas. 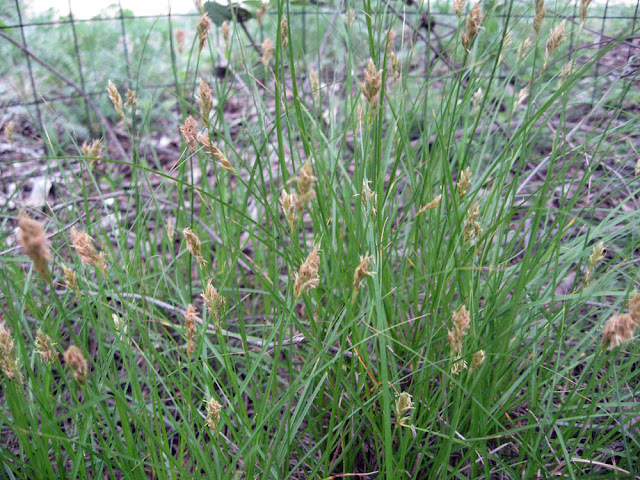 Known by the common names of Pale spikerush, Common spikerush, Creeping spike rush and Wire grass, Eleocharis macrostachya shares many characteristics with Eleocharis palustris; some specimens have been included in this and several other Eleocharis species in the past. 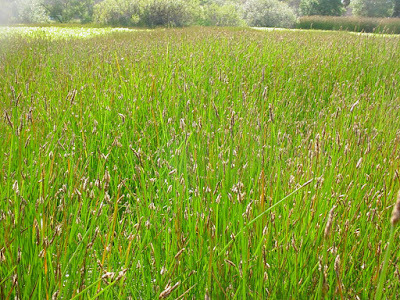 There is widespread morphologic variability within Eleocharis macrostachya, even in California, so future taxonomic revisions shouldn’t surprise us. Madrona Marsh Preserve, Torrance CA. 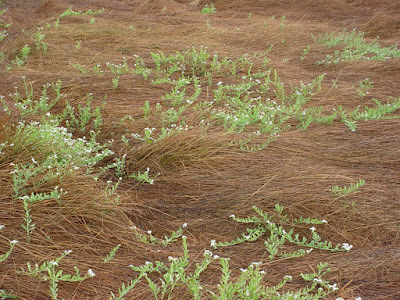 Pale spikerush is a rush-like perennial that spreads via rhizomes to form dense mats. In lowland S. California, seeds germinate – and plants begin to grow – with the winter rains. The under-water stems are hollow; stems become pith-filled on land, giving them added stiffness. 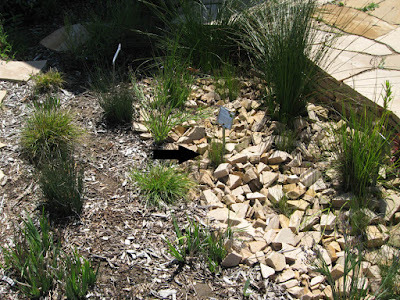 The plants can grow either in shallow standing water or in moist soils, making them useful for seasonally moist areas like rain gardens and infiltration swales. The plants continue to grow until the dry days of summer, when they become dormant and turn a lovely glossy tan. with rudimentary leaves at base. Pale spikerush is 12-18 inches (30-45 cm.) tall. It can grow as a single stem, as a tuft-like cluster of stems or as a mat-like ‘sod’. The stems have very rudimentary leaves (thin, red-brown sheaths at the base of the stems) and are smooth and upright (see above). 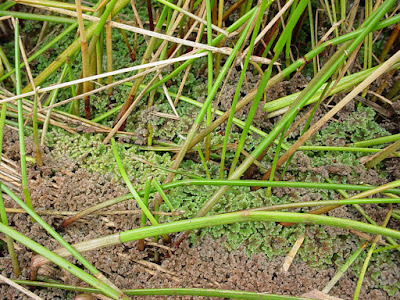 Stems are pale yellow-green under water, medium green on land. This is a simple, but pretty wetland perennial. The flowers of Eleocharis macrostachya grow in purple-brown spikelets at the ends of the stems. As seen in the photo above, flowering plants are showy, even though individual flowers are rudimentary. The spikelets are slender and cylindrical, somewhat like a flame on a candle, and contain many small flowers, each encased in a floral scale. Since the flowers are wind-pollinated, there’s no need for fancy petals to attract animal pollinators. Instead, the sexual parts are well-situated to ensure pollination (see below). The seeds are enclosed in a gold-brown achene (capsule with one seed) that drops from the plant when ripe. 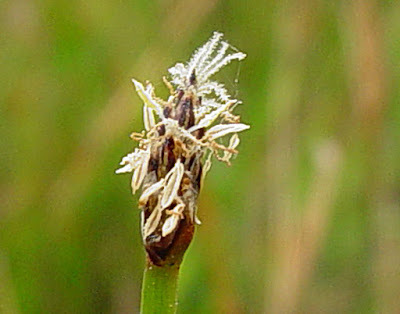 Pale spikerush (Eleocharis macrostachya): close-up of spikelet. Pale spikerush is a very adaptable plant. It will grow in just about any soil, including clays and the sandy, alkali soils along our coast. It tolerates full sun to fairly shady conditions, with flowering more reliable in full sun. 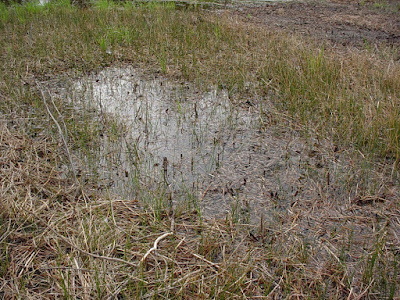 It does need moist soils in winter/spring and can even tolerate seasonal flooding or shallow standing water, particularly if water levels are allowed to fluctuate through the year (becoming shallower or dry in summer/fall). (Eleocharis macrostachya) is indicated by arrow. 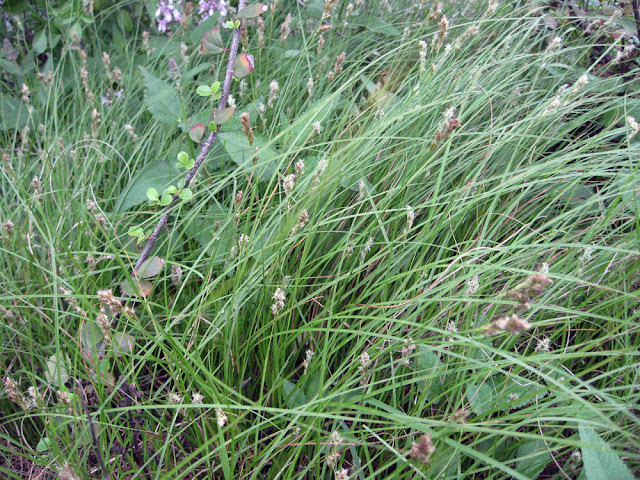 Pale spikerush is most commonly used as a pond/pool plant or in rain gardens, vegetated (infiltration) swales or bog gardens. We grow it in our rain garden and as a grass substitute under our Elderberry tree at Mother Nature’s Backyard. It does fine with occasional (monthly or twice-monthly) summer water. 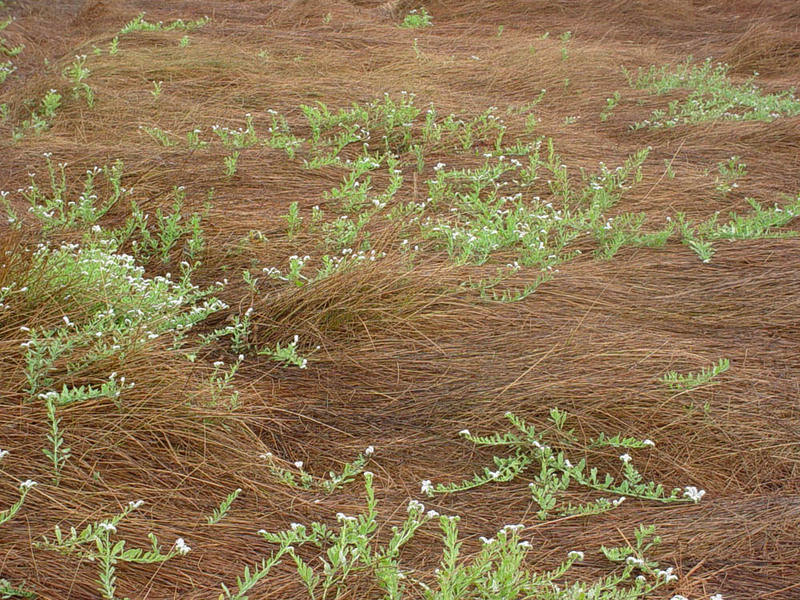 When grown in mass (like a turf) it becomes a lovely ‘straw’ groundcover in late summer/fall. In fact, spikerush straw is harvested in some parts of the world. 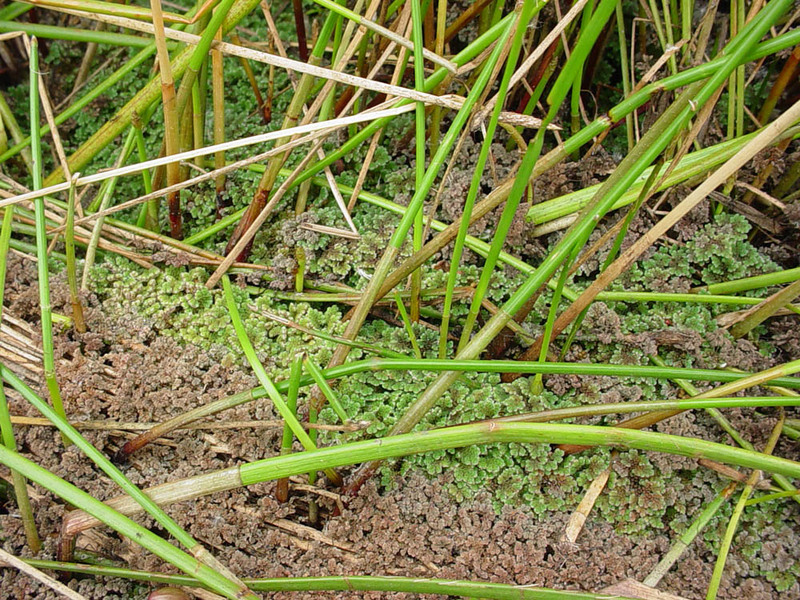 Several points should be emphasized regarding Eleocharis macrostachya. 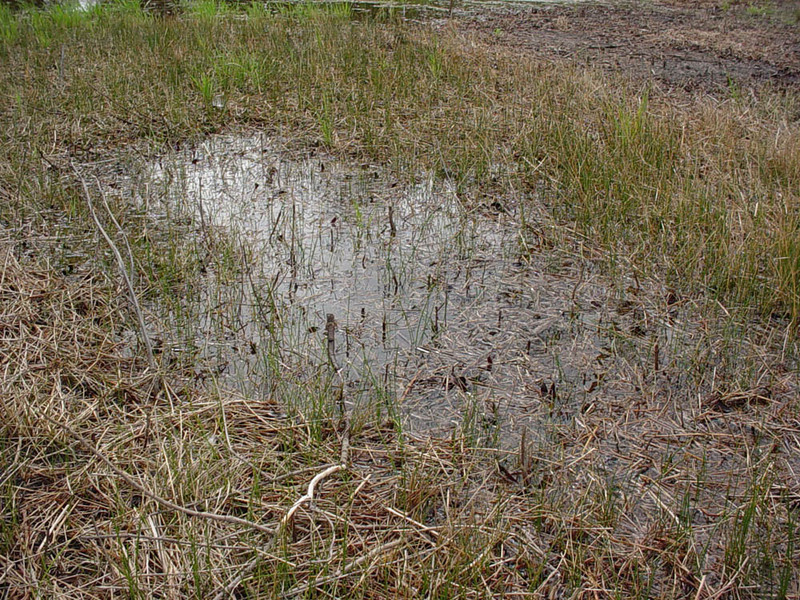 First, it is a wetland plant that spreads via rhizomes. In our personal experience, it’s not particularly aggressive in a fairly dry garden. But if you water frequently – and want to limit its spread – then plant it in a container. The second issue involves plant-plant interactions. Some sources note that Pale spikerush may inhibit the growth of other plants. 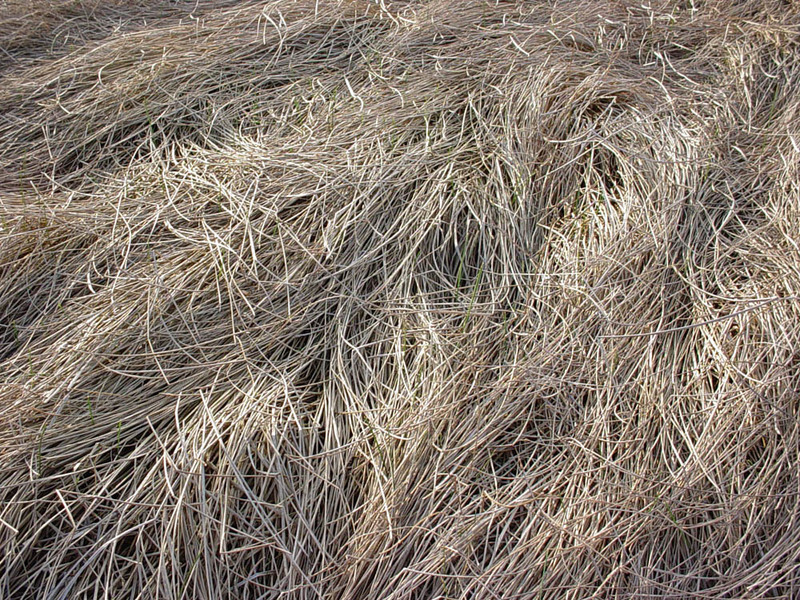 We’ve not noticed this ourselves and suspect it may be most important when dense Eleocharis ‘turf’ is allowed to dry, uncut, and release chemicals into the soil. Pale spikerush (Eleocharis macrostachya) straw in summer. That being said, Eleocharis macrostachya is a wonderful native for seasonally moist areas. It’s great for rain gardens and ponds, stabilizing the soil on banks and slopes. It is easy care, requiring only the removal of dead stalks in fall. It provides food and cover, as well as nesting materials, for birds and smaller animals. 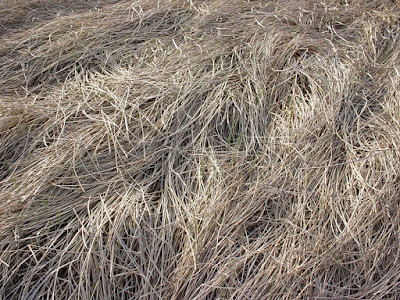 In days of old, the stems were used for weaving and dried stems for stuffing pillows and bedding. Some Native American tribes used the plant as a medicine to induce vomiting. We love Eleocharis macrostachya as a reminder of the seasonal wetlands once common in the South Bay. Spikerushes tie us to the past, providing a sense of place. Ironically, our rain gardens and seasonal swales have become our region’s wetlands. They are places where the plants of old continue to thrive, a remnant of the vibrant ecosystems that were once the heart (and kidneys) of our region.